Like quite a few of you, we’ve been following the Great British Bake Off and marvelling at some of the delicacies they come up with – last week’s Swedish Princess Cake for example, looked magnificent! (It involves a layer of sponge, topped with jam, topped with pastry cream, topped with whipped cream and covered in marzipan) And like some of you, we’ve found it hugely inspiring – both by giving us ideas for our own cooking and also motivating us to try things that we ordinarily shy away from. And as the days get chillier, September seems like the perfect month to start thinking about recipes that take a little more time to cook and a little more time to eat! Originally, we envisioned this recipe as being our version of empanadas de Calabaza, but we were so motivated by this book that we thought we would use a rough puff pastry instead. 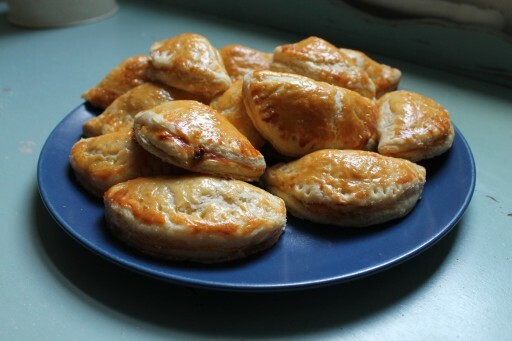 And of course, the pastries came out looking undeniably like distinctly British squash and goat’s cheese pasties. But you won’t be disappointed, these are delish! Prepare rough puff pastry according to the Leiths recipe (as set out here). Chill until needed. Lay out the cubes onto a lined baking sheet. Drizzle oil all over the squash and bake in oven at 200C (fan-assisted) for 20 minutes until soft. Then take out of the oven and set aside to cool. In a mixing bowl, then mash the squash roughly with a fork. Add the goat’s cheese, cumin, cinnamon and salt and mix thoroughly. Take out the chilled dough and roll out to about 3-4mm thickness. Using a pastry cutter (ours is 9cm), cut out circles of dough. Using up all the dough, we ended up with 15 circles. In the second half of each circle, add 1 tsp of the squash/goat’s cheese filling. Be careful not to put too much otherwise it’ll leak during the baking. You might end up with leftover filling but that’s okay! Brush some of the egg wash on the “half moon” border of the filling on each circle. Fold the top half of each circle over he filling to create a pasty shape. 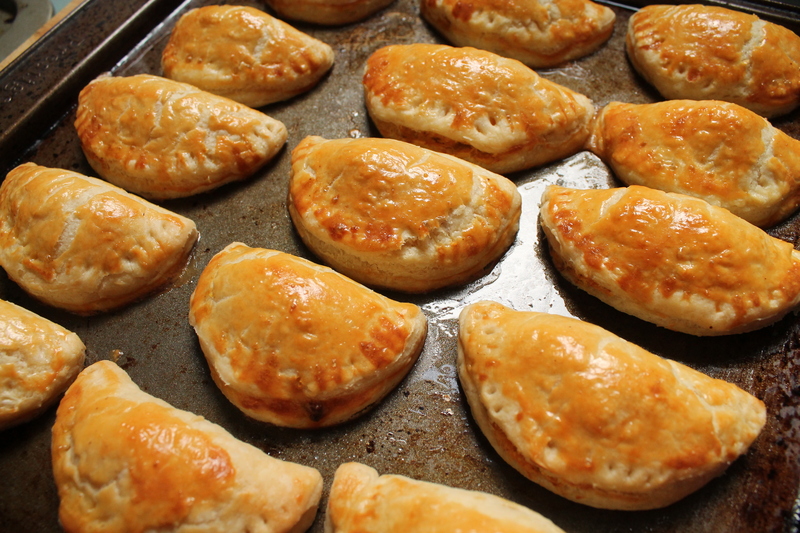 Place on a greased baking sheet and brush with egg wash.
Refrigerate the baking sheet for 30 minutes until the pasties are completely firm. 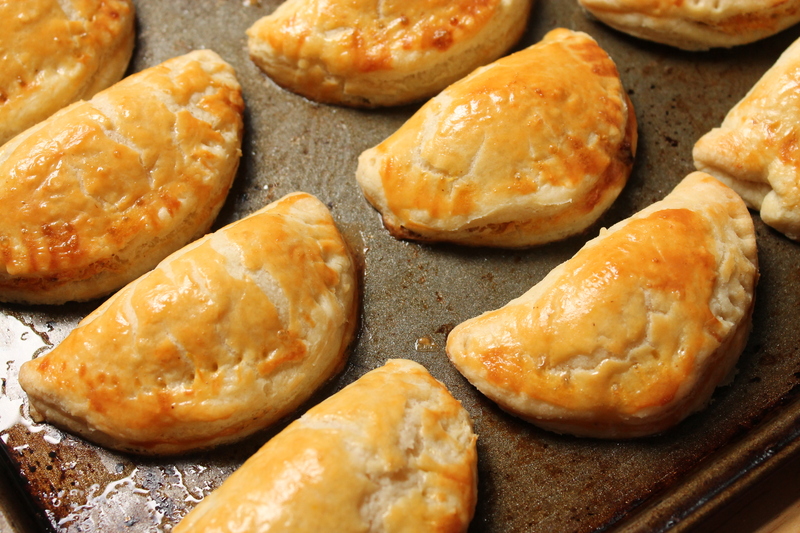 Bake the pasties for 20 minutes at 180C (fan-assisted) until golden. Enjoy immediately or refrigerate for a few days. I always have a roll of puff pastry in my freezer – it’s great to use in a pinch!